Self Realisation Tour of Northern India and Nepal during April 2015 | Realise the World! 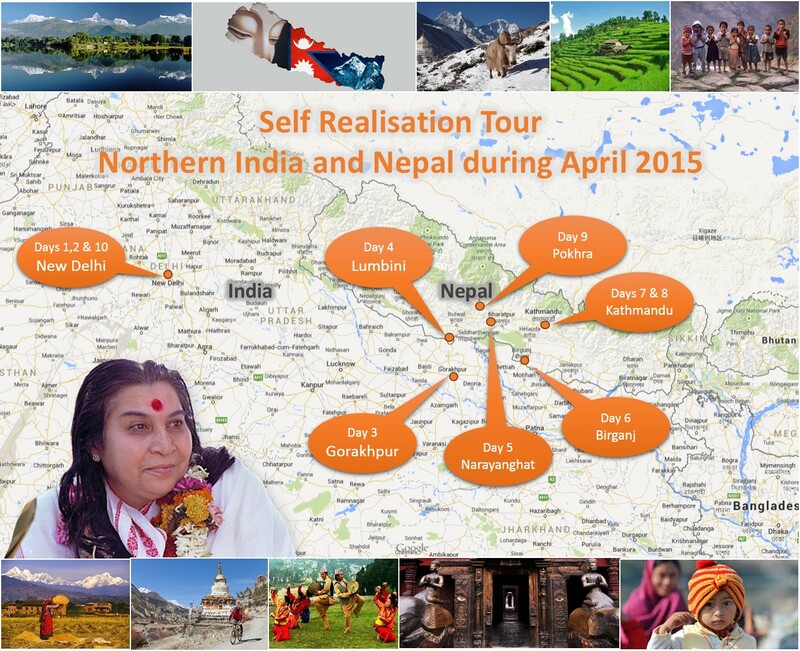 We are pleased to announce the Sahaja Yoga Self Realisation Tour of Northern India and Nepal for 2015. The Tour will start around April 3rd or 4th and end around April 16th. The Self Realisation Tour is open to all Yogis who wish to attend. Musician are also welcomed to attend. Days 1 & 2 – Delhi and neighbouring areas – Nirmal Dham, Nirmal Prem Ashram, Collective program in UP village, Day trip to Agra. Leave for Gorakhpur (UP) on Day 3 eve by train. Day 3 – Arrive at Gorakhpur early morning , Collective program in evening. Day 4 – Early morning depart for Lumbini (Nepal, birth place of Shri Gautama Buddha) by coach, arrival by lunch time. Night halt at Lumbini. Day 5 – Leave for Narayanghat (Nepal) and on to Sauraha. Night stayover at Suraha. Day 6 – Visit neighbouring forest reserve, evening collective program with Birganj (Nepal) collectivity. Day 7 – Depart by early morning by coach for Kathmandu (Nepal), a six hour drive. Evening program with Kathmandu collectivity. Day 8 – Stopover in Kathmandu. Day 9 – Drive to Pokhra (Nepal) and collective program with Pokhra collectivity. Day 10 – Return to Delhi by flight. Days 11 & 12 – Nirmal Dham then return home.